Miss Saigon's inspiration was apparently a photograph, accidentally found by Schönberg in a magazine. The photo showed a Vietnamese mother leaving her child at a departure gate at Tan Son Nhut Air Base to board a plane headed for the United States where her father, an ex-GI, would be in a position to provide a much better life for the child. 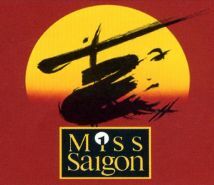 Schönberg considered this mother's actions for her child to be "The Ultimate Sacrifice," an idea central to the plot of Miss Saigon.